In response to a second notice for taking steps to curb fake news on its platform, WhatsApp senior executives from its US headquarters and India operations have met the Election Commission for its effort to prevent misuse of the platform in India’s coming election cycle. According to WhatsApp, it will look out for spam messaging techniques in the run-up to state polls scheduled for 2018-end, from the time the model code of conduct kicks in, and especially 48 hours before polling. Furthermore, WhatsApp will also bring a fake news verification model it recently used in Mexican general elections to India. The WhatsApp team which is currently in India will also meet big Indian banks, which need to be its partners in its peer-to-peer digital payments solution. 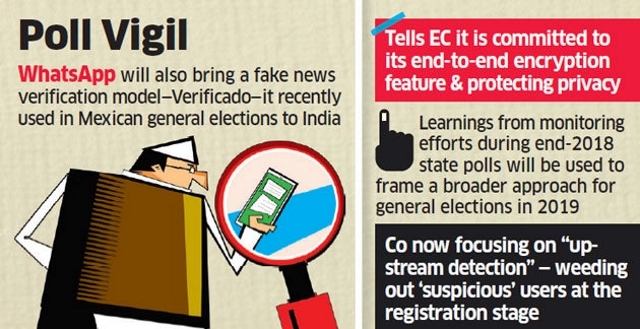 Additionally, the EC officials and WhatsApp executives said learnings from monitoring efforts during end-2018 state elections will be used to frame a broader approach for general elections scheduled for 2019. Speaking about the verification model, WhatsApp intends to bring the Verificado model to India. Verificado was a collective fact-checking exercise deployed by WhatsApp during recent Mexican elections. The messaging service is undertaking a similar exercise in Brazil, where 24 media outlets have come together to fact-check viral content and rumors. People familiar with WhatsApp’s developments have said that the company is now focusing on “upstream detection” — weeding out ‘suspicious’ users at the registration stage. Additionally, machine learning will be used to detect sequential numbers used to create groups.